Will HP’s Yoga-like Pavilion x360 get Lenovo’s chakras in a bunch? Dell needs an image makeover, according to Jonathan Guttell, Director of Global Consumer Messaging at the now privately held PC manufacturer. “Seventy percent of family computer-buying decisions are driven by high-school and college kids. And their perception is that Dell makes the products that they use in school or that their parents use at work," he said. "We’re not fun.” The new hybrids, all-in-ones, and tablets Dell announced on Monday at Computex in Taipei kick off the company’s efforts get the kids excited about its brand. “Devices have become part of the wardrobe” of these young decision drivers, according to Guttell. 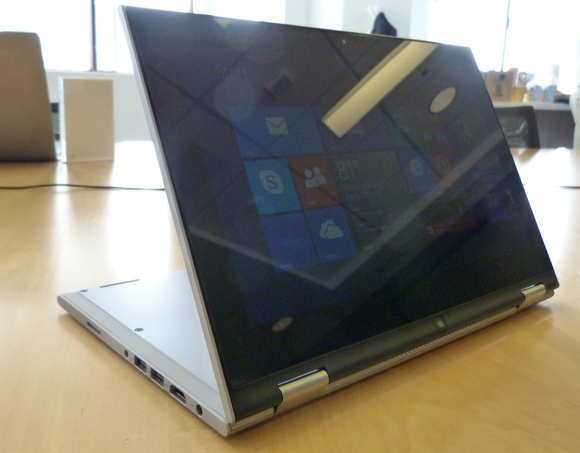 Looking at the new Inspiron-series 2-in-1 laptops, that wardrobe apparently includes Yoga pants. 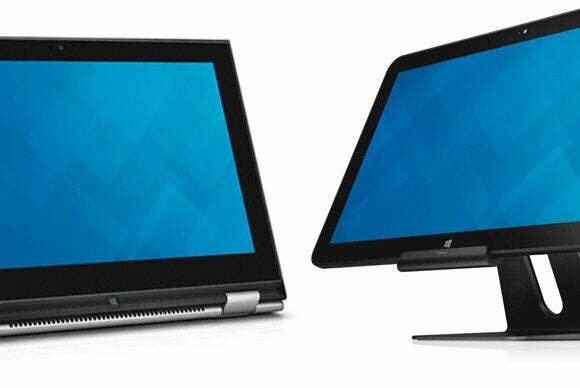 One of the most notable features of Dell’s upcoming 11- and 13-inch Inspiron-series 2-in-1 laptops are 360-degree hinges that allow them to be used in tablet, easel, tent, and conventional laptop modes—just like Lenovo’s Yoga-series notebooks. No, that's not a Yoga (or a Pavilion x360 or Satellite Radius, either). 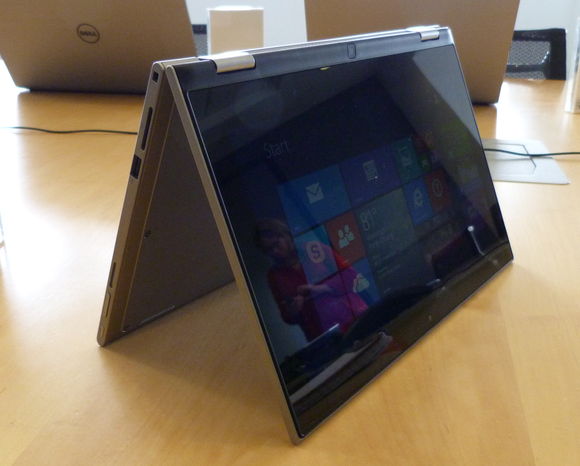 It's Dell's new Inspiron 2-in-1 hybrid laptop. 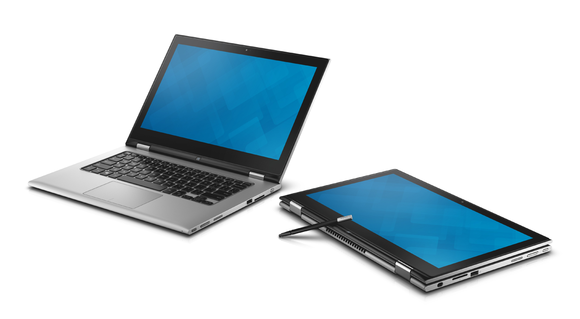 The Inspiron 11 3000 series is an entry-level 2-in-1 hybrid that will be available June 19, with prices starting at $450. Dell will offer multiple configurations with Intel Bay Trail-class processors (dual-core Intel Celeron N2830 or quad-core Intel Pentium N3530) and 4GB of DDR3L/1333 memory. They’ll have 11.6-inch IPS touchscreens delivering resolution of 1366x768 pixels, 720p webcams (with Skype preloaded), and 500GB hard drives. Optical drives will be optional. A single-stream 802.11n wireless networking adapter comes standard, but buyers will have the option to upgrade to Intel’s Dual Band Wireless-AC 7260 802.11ac adapter. 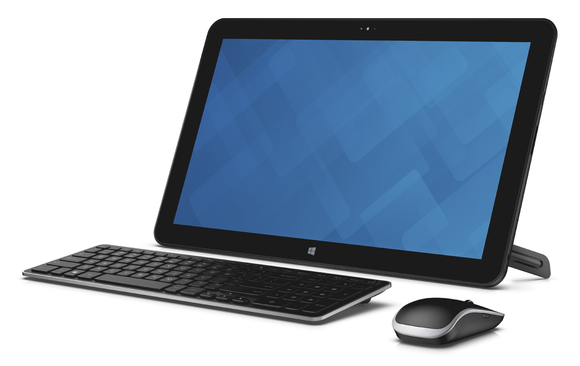 Dell will offer 2-in-1 hybrids with 11.6- and 13.6-inch touchscreens. Connectivity options will be somewhat limited, but what’s there is good: You’ll get HDMI 1.4a, one USB 3.0 port, two USB 2.0 ports, and a media-card reader. But you’ll need a USB adapter for hardwired ethernet. Bucking the trend of sealing up laptops, the Inspiron 11 3000 series will have removable batteries (a three-cell, 43WHr battery comes standard). Dell promises they’ll deliver more than eight hours of use on a single charge. 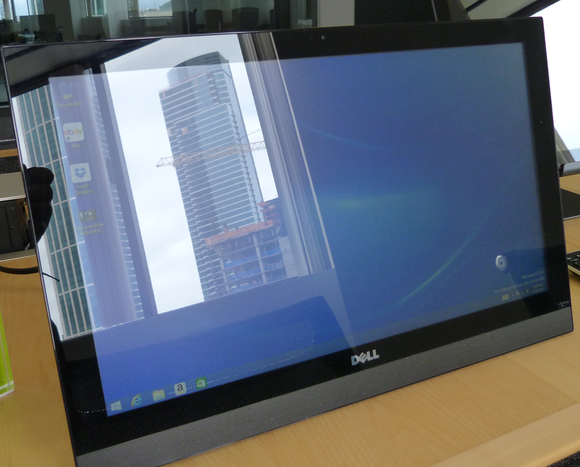 The Inspiron sample Dell showed me looked attractive and well made. It was 0.76 inches thick and weighed 3.07 pounds. Dell’s Inspiron 13 7000 series laptops will be outfitted with the same type of hinge, but these 2-in-1s will come with 13.3-inch touchscreens offering resolution of either 1366x768 or 1920x1080 pixels, Intel Haswell-class processors (Core i3 or Core i5), and either 4GB of DDR3L/1066 memory or 8GB of DDR3L/1600 memory. Buyers will be able to choose between a 500GB hard drive or a 500GB hybrid hard drive with 8GB of cache. A passive stylus for note-taking will come standard. The 7000-series 2-in-1s will come with backlit keyboards, HDMI 1.4a video outputs, two USB 3.0 ports, one USB 2.0 port, and media-card readers. Wi-Fi connections step up to either a Dell Wireless-N 802.11n or an Intel Dual-Band Wireless-AC 7265. This larger model will also be 0.76 inches thick, but as one would expect, it will be a little heavier at 3.68 pounds. The Inspiron 13 7000 won’t be available until September, and Dell did not disclose pricing. Dell will bundle a passive stylus with its Inspiron 13 7000 series 2-in-1 laptops. Dell struck a deal with Dropbox to give all Inspiron buyers 20GB of cloud storage. New Inspiron models will also come with Sensible Vision’s excellent FastAccess Anywhere facial-recognition software that can automatically unlock your PC and log you into websites as soon as your webcam spots your visage. Dell is making an effort to deliver better audio experiences, too. All the machines I saw came with Waves’ MaxxAudio high-definition audio software. Dell showed me two new all-in-one desktop machines, including a long-overdue Haswell-refreshed XPS 18. But first I’ll cover the revamped Inspiron 20 3000-series AIO. Dell has ditched the monitor-on-a-pedestal approach in favor of a picture-frame chassis. Although there’s no battery option, Guttell said the all-in-one was designed to be easy to move from one room to another inside the house. But I think that’ll be a hassle unless you upgrade to a wireless mouse and keyboard (wired devices come standard). But that decision—and installing Windows 8.1 with Bing—helped Dell deliver an all-in-one with a 19.5-inch TN display for just $350. Granted it’s not a touchscreen, and its resolution is only 1600x900 pixels, but that’s still a pretty good deal for a desktop PC with a dual-core Intel Celeron N2830 processor. A touchscreen will be available as an upgrade, as well as a quad-core Intel Pentium N3530 CPU. The barrier to entry to an all-in-one PC with decent horsepower has never been this low. The Inspiron 20 3000 series will come with 500GB of storage and either 2GB or 4GB of DDR3L/1600 memory (although the CPU will run that memory at a maximum speed of 1333MHz). I/O ports include HDMI-in (so you can use it as a display for a laptop, video-game console, or set-top box), three USB 3.0 ports, 10/100 ethernet, and a media-card reader. Wireless networking will be limited to 1x1 802.11n, plus Bluetooth. It goes on sale July 1. Dell made no changes to the form factor of its exciting XPS 18, but the battery-powered all-in-one will now be available with a Core i3-4030, a Core i5-4210U, or a Core i7-4510U CPU. The machine will be available with either 4GB or 8GB of DDR3L memory (up to 1600MHz), and its storage options will range from a 500GB mechanical drive, a 1TB drive with a 32GB SSD cache, or you can go the full Monty with a 256GB SSD. Dell's excellent XPS 18 all-in-one is getting a much-needed refresh with Intel's Haswell-class processors. The 18.4-inch, WVA (wide-viewing angle) touchscreen delivers resolution of 1920x1080 pixels. Dual-band 802.11ac Wi-Fi will come standard, as will a wireless mouse and keyboard. The portable will weigh just under five pounds with an SSD, and just over five pounds with a mechanical drive. Dell said consumers can expect to get a little more than six hours of use when away from an electrical outlet. Dell's Venue 7 and Venue 8 will be powered by Intel's Merrifield-class processors and run Android 4.4 (Kit Kat). Guttell told me Dell won’t be refreshing its Windows tablet line until the fall, but he did have two new Android tablets to show: The Venue 7 (7-inch, 1280x800, IPS touchscreen) and the Venue 8 (8-inch, 1920x1200, IPS touchscreen). I expect our colleagues at Greenbot will cover these devices in more detail, but these tablets will be powered by Intel’s dual-core Merrifield-class processors: The Venue 7 will be based on the Atom Z3460 and the Venue 8 will run on an Atom Z3480. 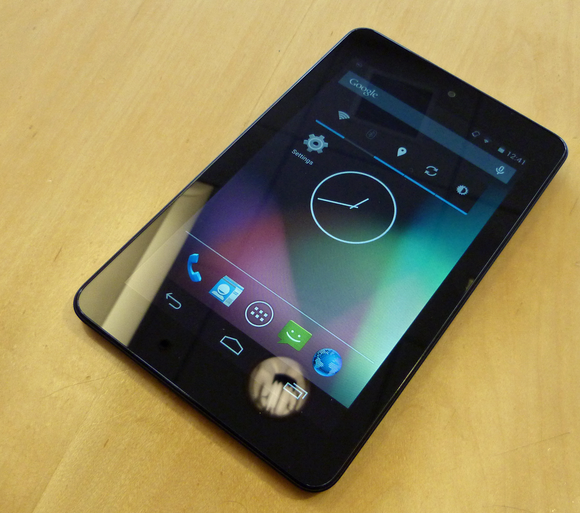 Both tablets will run Android 4.4 (Kit Kat) and be equipped with 1GB of eMMC memory and 16GB low-power DDR3 memory. The Venue 7 will be priced at $160 and the Venue 8 at $200 when they go on sale July 1.